New low-cost sampling scopes suit high-speed digital and microwave test. Fairport, NY, USA: Saelig Company, Inc. (www.saelig.com) announces that the Pico Technology PicoScope 9300 family of sampling oscilloscopes has been expanded with two new 25 GHz models - the PicoScope 9301-25 and 9341-25 models. These USB-controlled sampling oscilloscopes, designed for working with repetitive signals, are a low-cost alternative to extremely expensive high-end GHz benchtop scopes. The PicoScope 9300 series offers affordable high-integrity options for viewing and measuring RF and microwave signals, signal paths, and RF networks. These high-speed sampling oscilloscopes are the cost-effective solution for working with gigabit-per-second data-streams and their copper, wireless and optical fiber interconnects. These new two- and four-channel 25 GHz models add to the existing 20 GHz PicoScope 9300 Series, and can now support 5th harmonic capture for data speeds up to 10 Gb/s, and 3rd harmonic capture for data-streams up to 16 Gb/s. These rates are increasingly found in Ethernet, Thunderbolt, USB 3.1, PCIe 4, Rapid I/O, e-SATA, OC-192 / STM-64 and OC-256 situations. All of these technologies have transmission lines, cables, components, transmitters and receivers that need appropriate development tools for pre-compliance testing and characterization. Owning a real-time scope with a 25 GHz bandwidth has usually been prohibitively expensive, but now engineers can have their own 25 GHz sampling oscilloscope on any bench or wherever it is needed. Probing multiple broadband signals in-system and with minimal signal disturbance is also often a challenge. 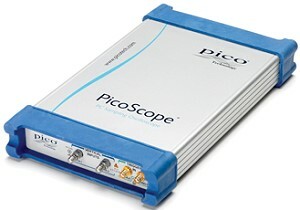 So Pico Technology has designed some cost-effective, low-invasive, high-performance PicoConnect 900 probes to accompany the 9300 family of sampling scopes. Uniquely configured as interchangeable AC- or DC-coupled probe heads in three division ratios (÷5, ÷10 and ÷20), these connecting devices are ideally suited for transparent in-system probing of analog, pulse, impulse and high-speed serial data streams. They can also be used with other non-Pico instrument types that have 50 ohm inputs. The PicoScope 9300 Sampling Oscilloscopes, when used with the appropriate PC, offer full touchscreen operation using the latest PicoSample 3 Software (provided free). PicoSample 3.25 also includes new masks for USB 2.0 and USB 3.1 Gen1 and Gen2. Made by Pico Technology, Europe's award-winning oscilloscope adapter manufacturer, the new PicoScope 9301-25 and 9341-25 Sampling Oscilloscopes are now available now starting at under $20,000 from Saelig Company, Inc. their USA technical distributor.